Here's some news anyone with an iPhone could have told you: AT&T delivers crappy service that its customers hate. But this news comes from a reputable source, Consumer Reports, instead of the usual whiny friends. 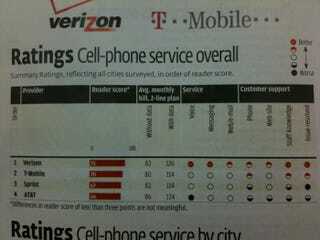 Yes, in 19 of the 26 cities surveyed, AT&T was ranked dead last in every category. Verizon was ranked the best, followed by T-Mobile, then Sprint and then, of course, bringing up the rear is our friend AT&T. You can compare their results to the results of our own nationwide 3G test here.